I don’t read as much fiction in translation as I should but when I see a novel translated by Carol Brown Janeway in the publishing schedules I sit up and take notice. It was through her that I first discovered Daniel Khelmann’s fiction, beginning with the very fine Measuring the World about two eighteenth-century German mathematicians: Alexander von Humboldt who enthusiastically travelled the world measuring everything in sight willing to endure the most horrendous conditions accompanied by the long-suffering Bonpland, and the irascible but brilliant Carl Friedrich Gauss, reluctant to leave his own bedroom let alone cross a border. Very different from the playful, episodic Fame which satirises celebrity and is also immensely enjoyable. 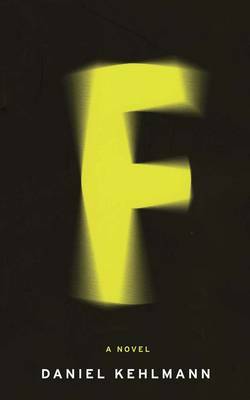 F is yet another different kettle of fish and already I have that rare feeling of looking forward to reading it again. There’s so much in this slim novel that one reading won’t suffice. Years later, long since fully grown and each of them enmeshed in his own particular form of unhappiness, none of Arthur Friedland’s sons could recall whose idea it had actually been to go to the hypnotist that afternoon. Unhappiness, indeed. Martin grows up to become a faithless priest struggling and failing to keep his burgeoning weight under control, still in the grips of his boyhood obsession with Rubik’s cube. Eric becomes a financier, on the brink of ruin having lost his most important client’s fortune, unable to keep his sexual peccadilloes under control and plagued by a terrifying paranoia, while his twin Ivan, the executor for the artist Eulenboeck whose work fetches a pretty price, satisfies his own thwarted artistic ambitions in a somewhat unorthodox way. Their father, immune to the Great Lindemann’s hypnotic techniques, or so he insists, packs up and leaves shortly after the performance on that long ago afternoon in 1984, becoming a household name when his book My Name is No One, triggers an existential crisis in the nation. That’s the bare bones of it but Kehlmann’s novel is very much more subtle than that. Written in a mixture of three different first-person narratives with third-person sections criss-crossing time and assorted other devices you’d think that F might become a little fragmented but Kehlmann is so deft that it flows beautifully. You never quite know which way you’ll be taken next but that’s part of the enjoyment. Along the way, Kehlmann takes swipes at both the art and financial worlds, religion and a whole barrage of modern obsessions, carefully aiming barbs here and there with a hefty helping of quiet humour. All the various pieces of his puzzle fit together beautifully, clicking smoothly into place. If Jeffrey Eugenides hadn’t already used the analogy, I’d compare it to Martin’s beloved Rubik’s cube. Of course none of the many pieces of Kehlmann’s narrative puzzle would fit so snugly were it not for Janeway’s faultless translation. They truly are a brilliant pairing. If you know of any other combination aside from Murakami’s translators – also a match made in heaven – I would love to hear about it. This entry was posted in Reviews and tagged Carol Brown Janeway, Daniel Kehlmann, F, German fiction, Quercus on 29 October 2014 by Susan Osborne. Two translated books in a row, one more and it’ll become a habit 🙂 With the online crowd you hang out with, you certainly are hearing about some good ones. This sounds like a perfect contender for the many anticipating German Literature month coming up in November. I’m always too slow for challenges like that, but think I’ll try once again to finish the Jenny Erpenbeck book on the shelf. Might be a while before I get to Kehlmann. Love that first line! I loved that first paragraph. Grabbed me from the get-go. I seem to have hit my stride with translated works this month – I have two posts on Scandi novels in the works. Perhaps it’s your and Jacqui’s influence! I also have the new Erpenbeck waiting. I’ll look forward to that, Claire! I’m way at the back of the class with my quota of translated novels – although I do have an Israeli one to showcase next week. This sounds an interesting book, Susan. I’ve read a fair few novels about Germany recently but I don’t think I’ve read any translations from the German since Heinrich Boll! An Israeli novel sounds interesting, Anne. I’ll look out for that. Can’t recommend Kehlmann highly enough if you wanted to kickstart your German literature reading. An entirely new name to me but – as ever! – your wonderful review makes me most curious to try this novel. I’m a fan of fragments beautifully brought together – one of my favourite devices, in fact. p.s. as for books in translation, Magda Szabo’s recently translated rerelease, Iza’s Ballad leapt straight onto my top ten for this year. Thanks for the tip, Victoria. I picked this up in Waterstone’s recently then put it back again but obviously should not have! I hope you give F a try, one of my own books of this year.